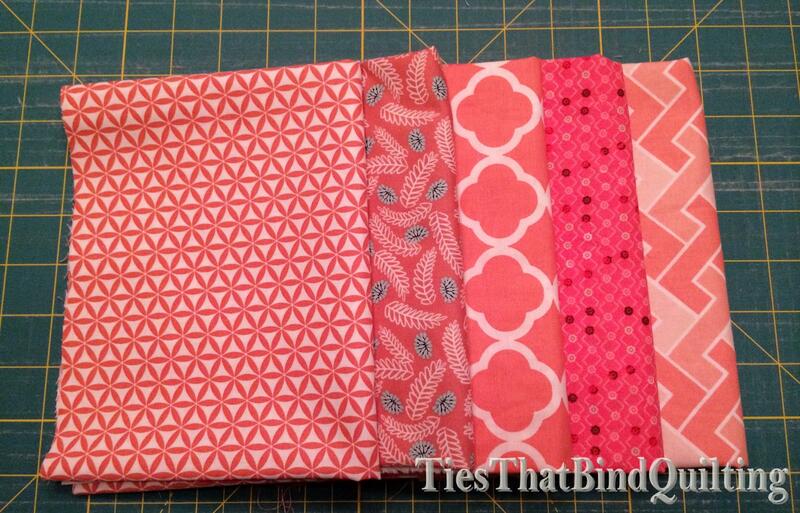 Stash Bee 2015 – February Was My Month As Queen! 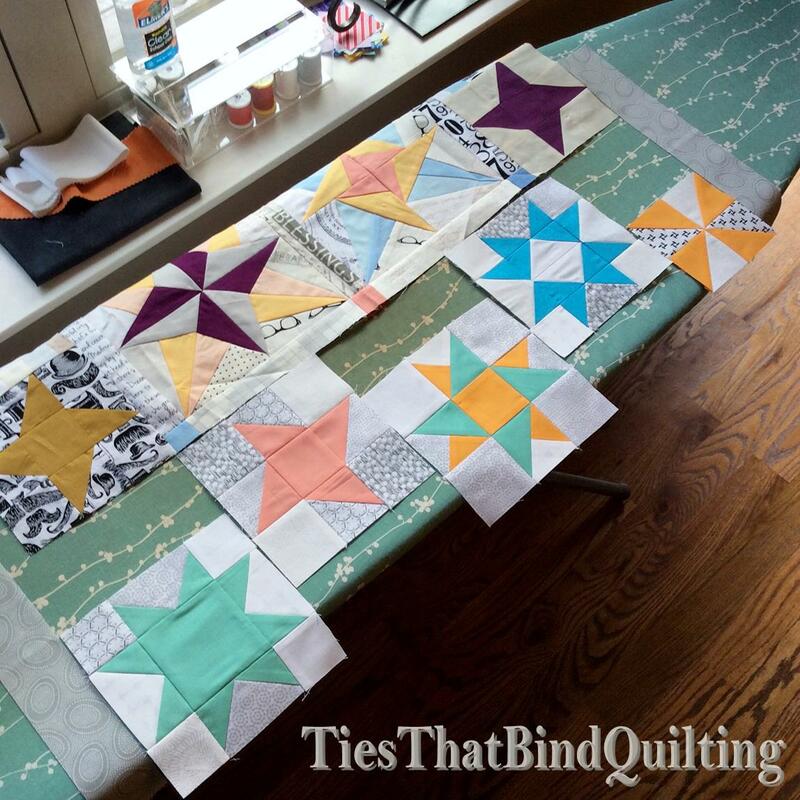 February was my month to be Queen Bee for Stash Bee so I had an extra busy January making both Lynn’s blocks as well as my example blocks so I could put together my tutorial post for the Hive. 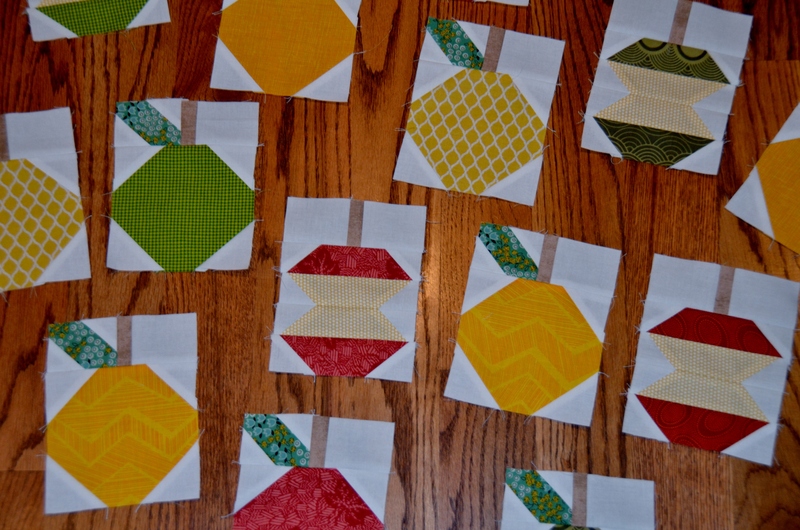 As I mentioned before, pregnancy fatigue and general baby preparations have been stealing my sewing time so I figured my Stash Bee Hive could help me make blocks for a quilt that would coordinate with our little girl’s nursery. Below is the color scheme we chose for the nursery. I wanted something that was definitely girly but wasn’t just pink everywhere. I also took some photos of my fabric pull to hopefully give my fellow hive members a good feel for the look I was going for. 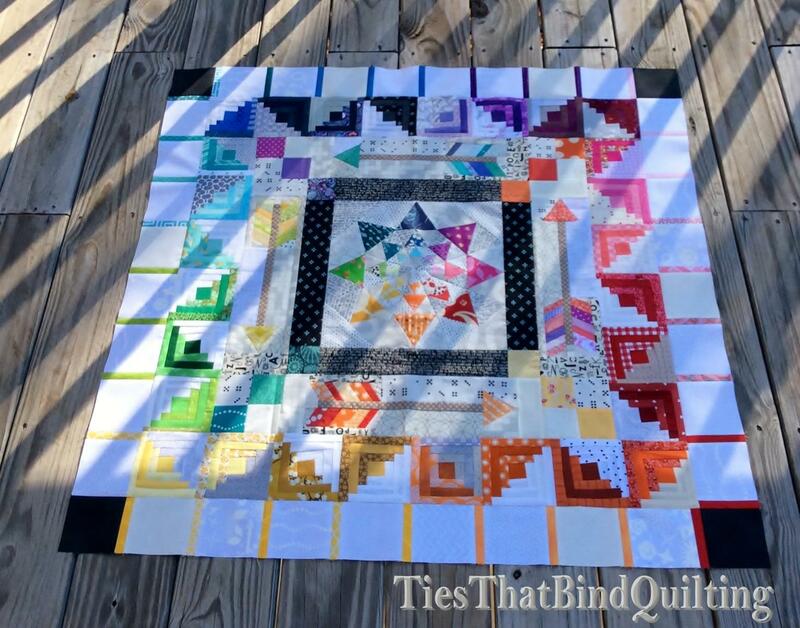 Here is my block choice for this month – colorful string blocks with a 1/2″ (finished) solid white stripe down the middle! 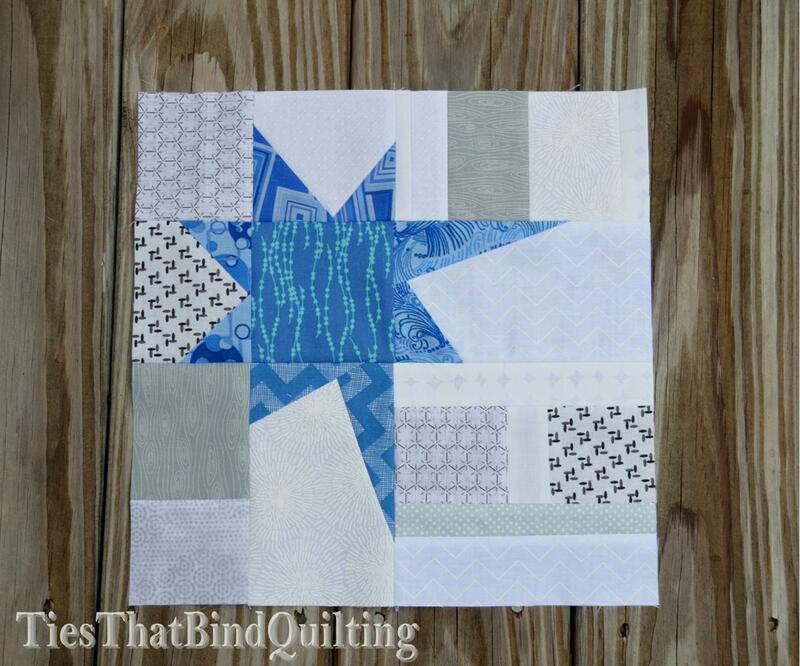 This block is made using a tutorial for Paper Pieced String Quilt Blocks that was put together by Film in the Fridge. 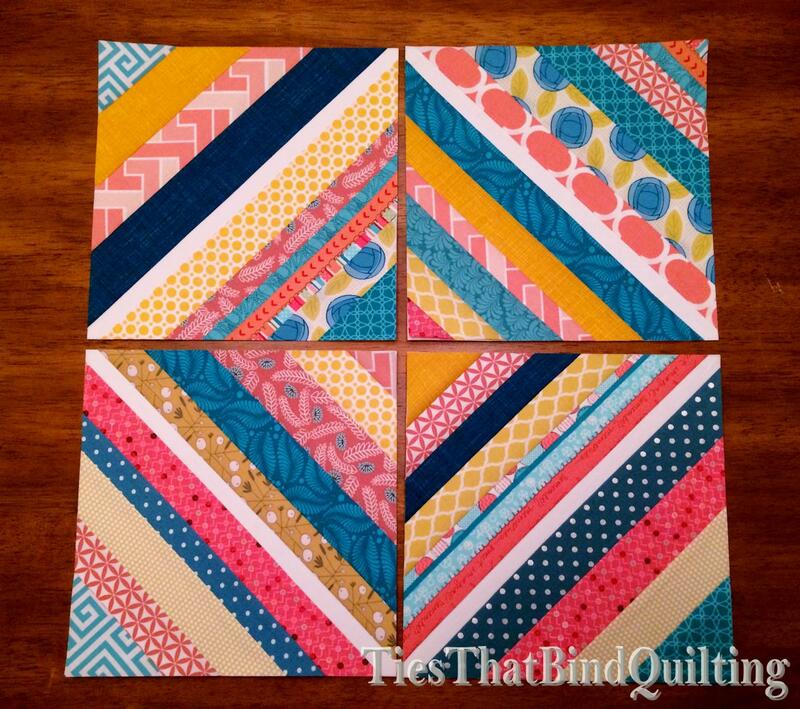 I found the tutorial really easy to follow and have loved seeing my blocks start to arrive at my house. I can’t wait to put them all together! 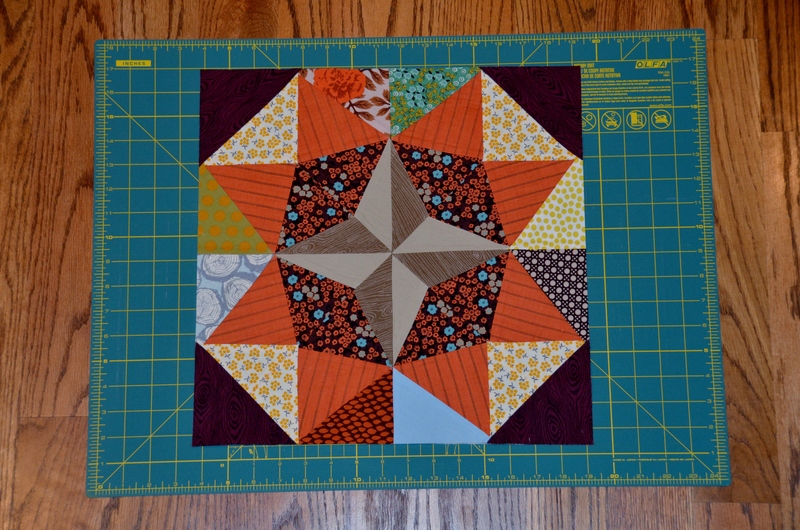 For the third round of our travelling quilts group, Round Trip Quilts, I got the chance to add on to Mary’s quilt. 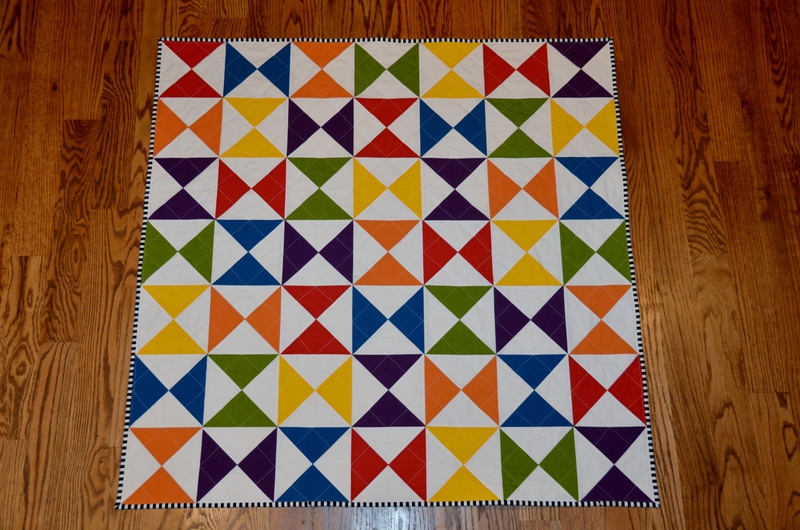 Mary blogs over at See Mary Quilt. 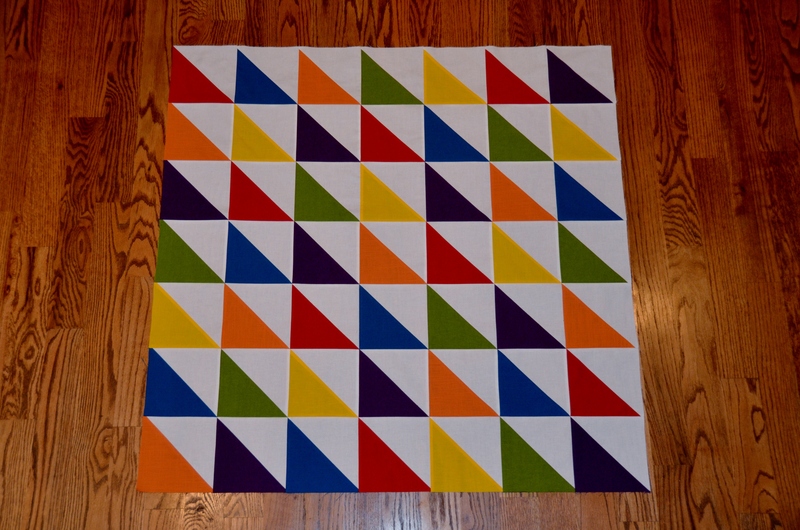 Mary’s quilt top has a rainbow and low volume theme to it. Now I must admit, Mary is lucky that this quilt top didn’t conveniently get “lost in the mail” because I love how it is looking so far and wanted to steal it for myself! 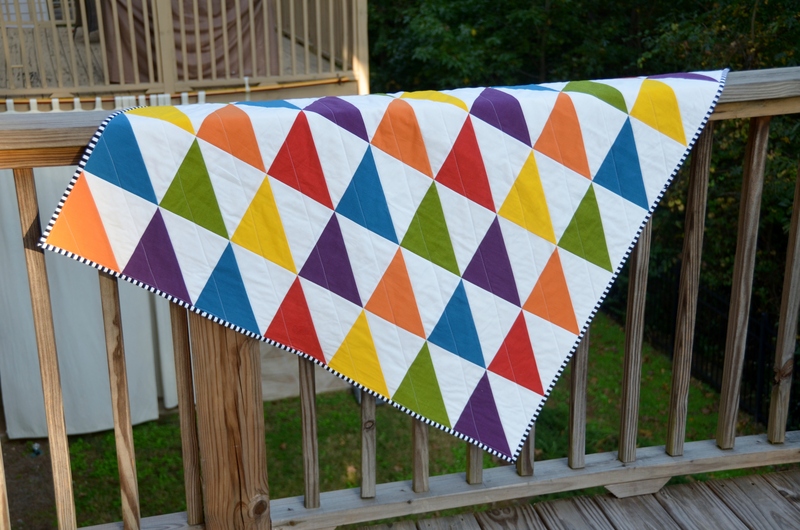 I loved the rainbow pattern that was flowing around each border but I also felt like it was ready to have a calmer, more quiet border to break up the color a little bit. But I couldn’t completely give up the rainbow effect, so I decided to make skinny strips of color between larger white on white blocks! I think the border ultimately accomplished just what I was hoping for! The eyes have a bit of a place to rest between the super colorful borders without giving up on the rainbow side of the theme. 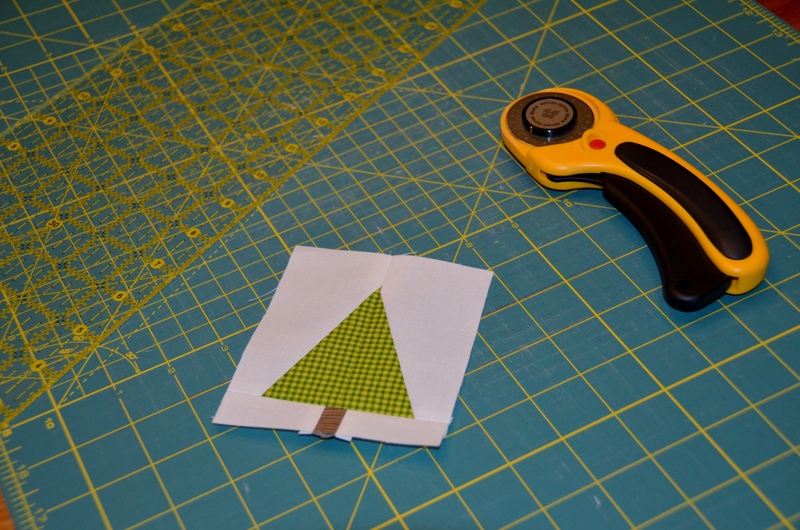 The colored strips finish at just half an inch wide so they are really more of a subtle touch of color. I used some black “chalkboard” fabric for the corners to tie back in to the black patterned borders from near the quilt center. So I enjoyed Stash Bee so much last year that I decided to take part in it again this year. For 2015, I am a part of Hive 5 with Lynn as our lovely Hive Mama. 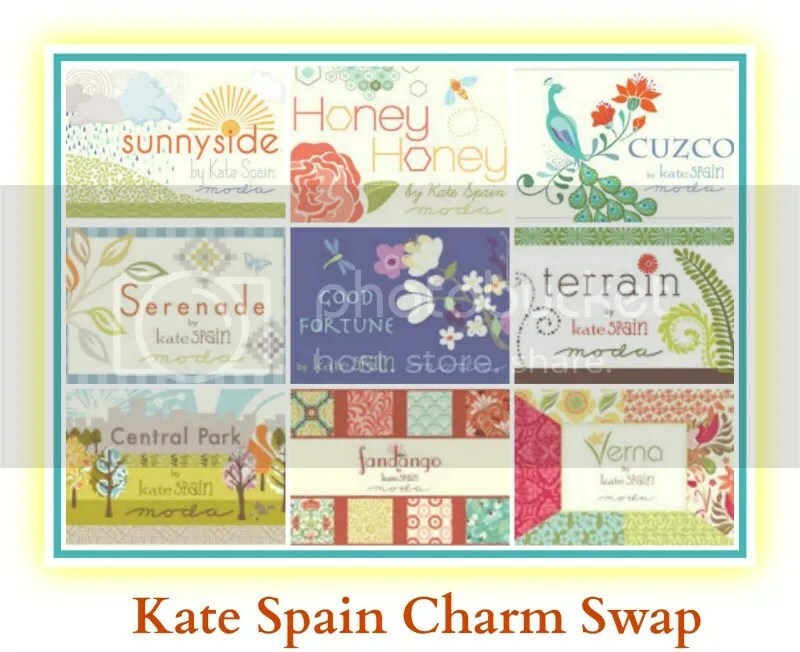 Lynn blogs over at K&S Design Girls. As Hive Mama, Lynn got to be our first Queen for January to start to year off. 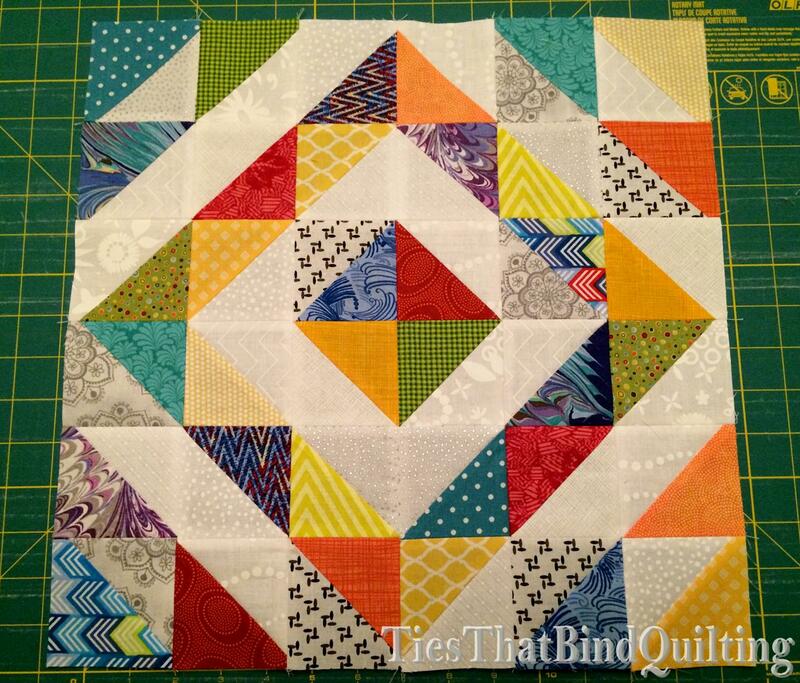 Lynn requested a scrappy HSTs block using bright colors and low volume prints. 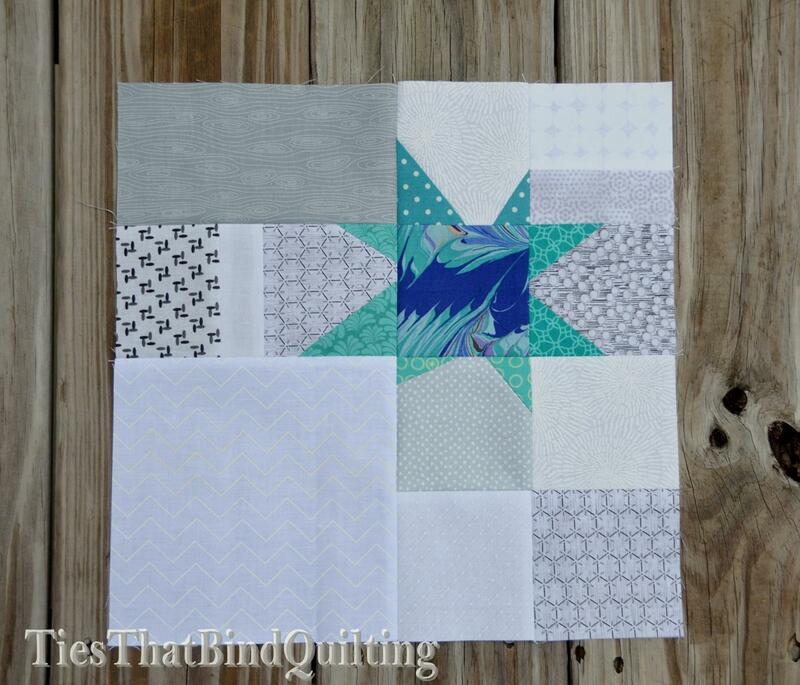 I had a lot of fun digging through all of my colorful fabrics to cut squares for this block! 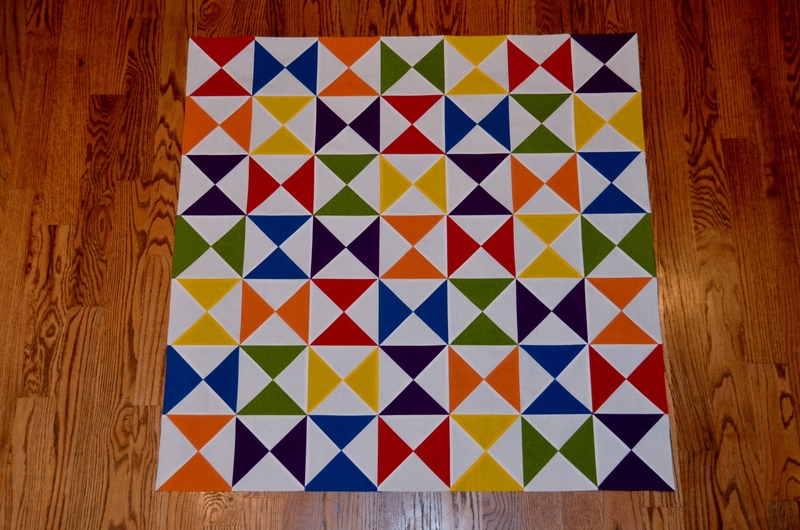 I hope Lynn likes it and can’t wait to see this colorful quilt come together! 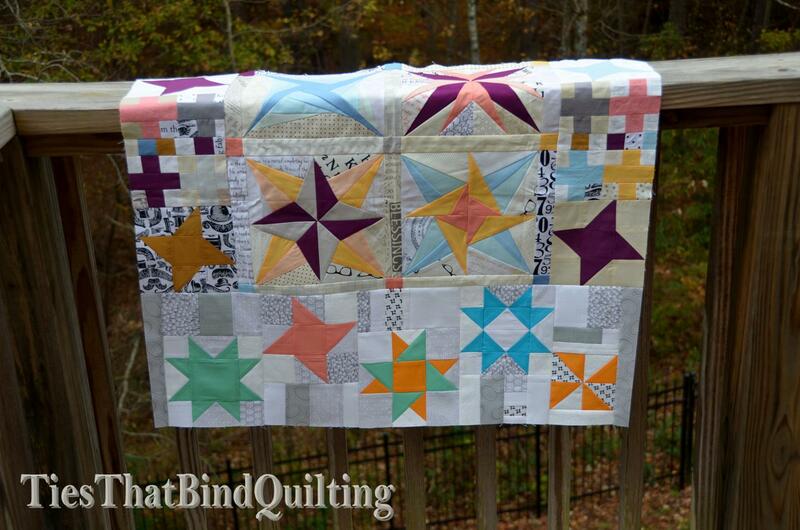 We’ve also had a couple of rounds of additions to our group of travelling quilts for Round Trip Quilts! For the second round, I got to add on to Chelsea’s quilt. 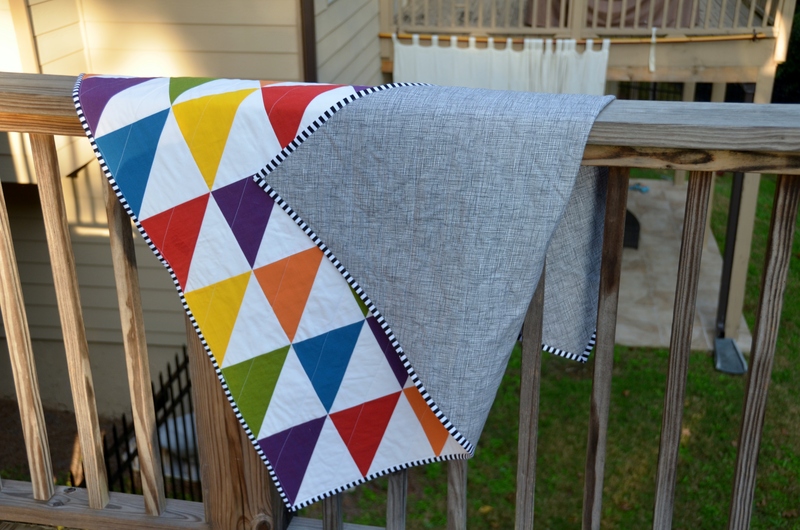 Chelsea blogs over at Patch the Giraffe and her quilt is themed around solids with a low volume background. 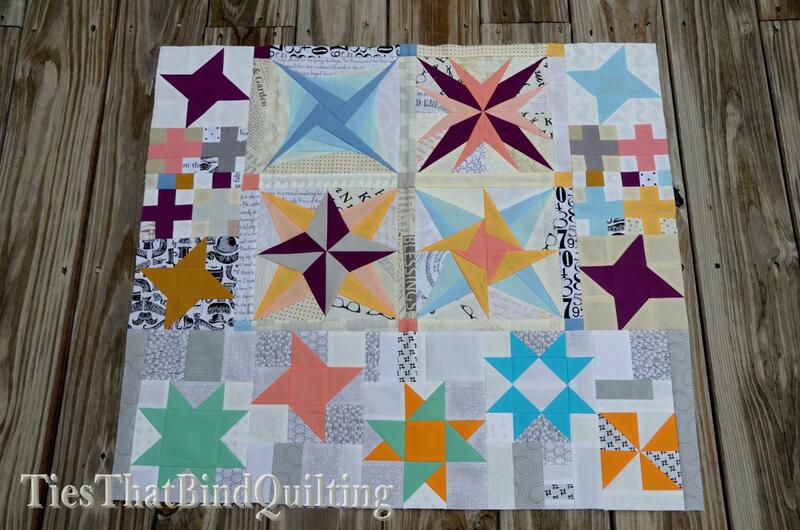 I love the paper pieced stars she used for her starting block! I decided that I was going to add one wider border to a single side of Chelsea’s quilt instead of encircling it with a smaller border. 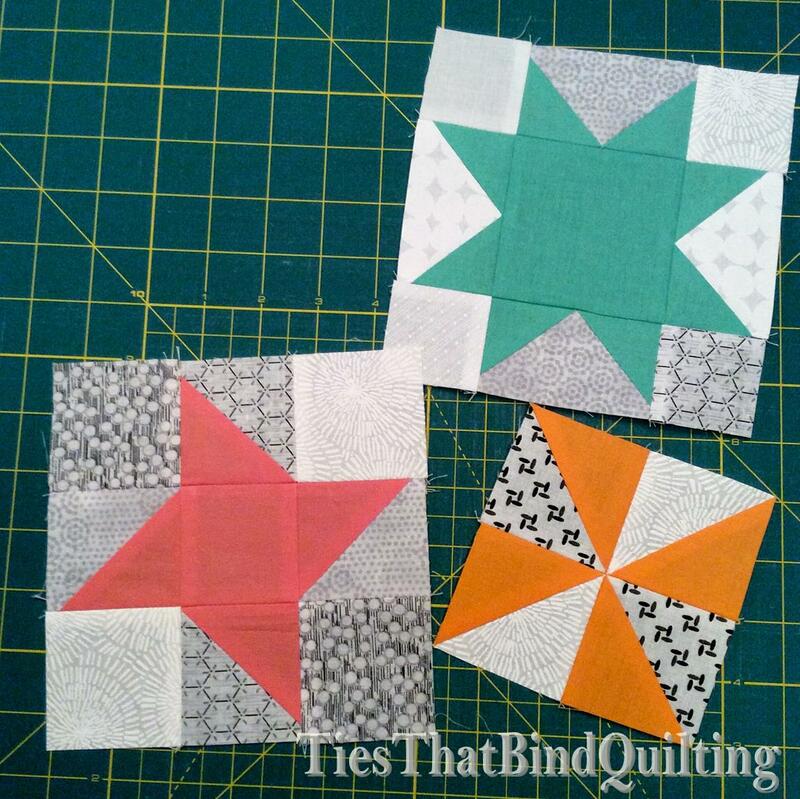 So I started off making a variety of stars and other small blocks using some solids and low volume background. 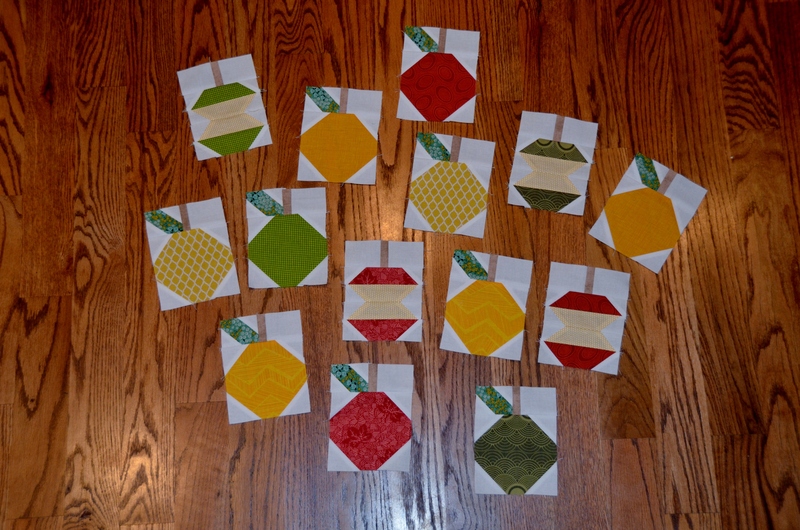 Then I laid them out alongside the quilt top and figured out I layout I liked. This allowed me to easily see and measure where I needed to fill in more low volume background. 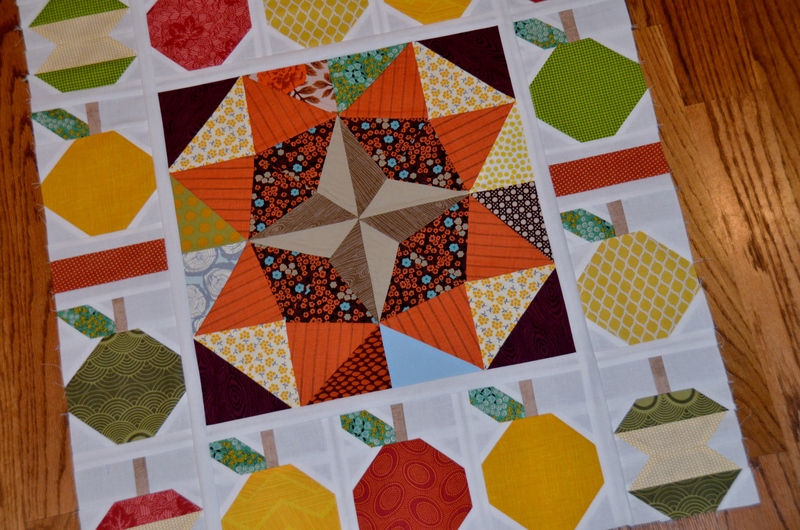 Soon, I had a finished addition containing five blocks on a scrappy, low volume background! 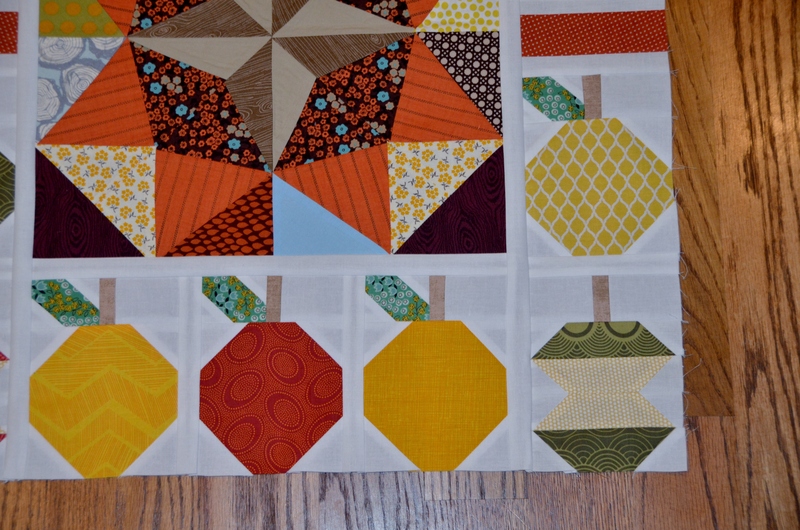 I added in along the bottom of the quilt top and I love how this quilt top is coming together so far! I hope Chelsea likes it as much as I do! It was sent off late late year to the next person in our group so this top has even more added to it at this point! 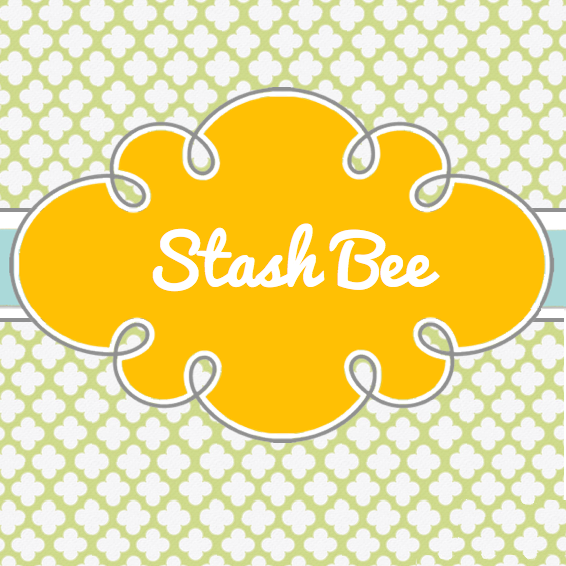 Our last month of Stash Bee 2014 was November and Sue was our Queen Bee for the month. She asked for scrappy and wonky stars on a low volume background. She even gave us a bunch of colors to choose from for the stars so it was really easy to work with what was in my scrap pile. What wasn’t so easy (at least for me) was the wonky part. I’m too much of a perfectionist sometimes and I struggle to sew wonky. I’d rather just make it all straight and even! I hope my blocks ended up wonky enough for Sue’s liking. They made their way up to Minnesota back before Thanksgiving. 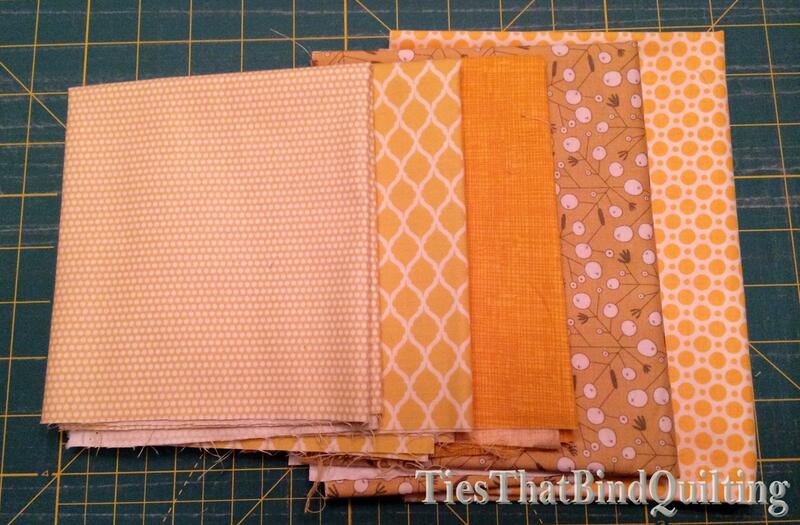 And that was a wrap for Stash Bee 2014! I have so much to post about but life has totally gotten in the way lately. 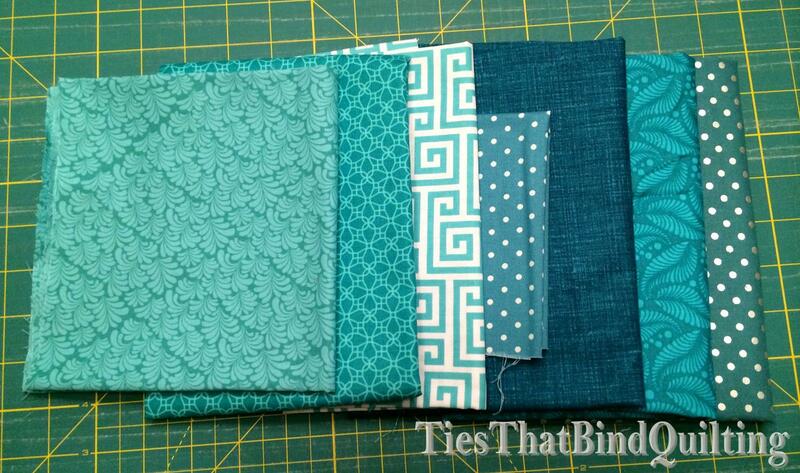 Time to try to catch you guys up to speed with my life and my sewing! 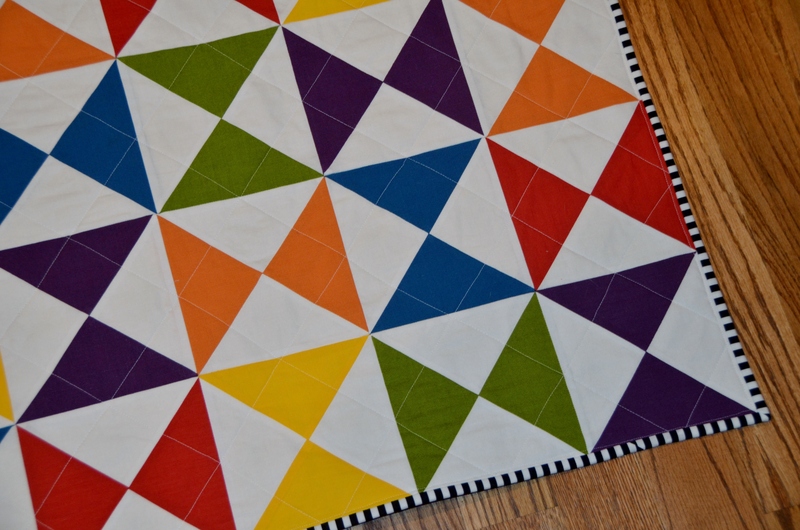 Remember the colorful solids I was playing with a while back? I mixed and matched between designers a bit so the set had Kaffe Fassett Shot Cottons, Pepper Cory’s Peppered Cottons, and Andover’s Textured Cottons all included. 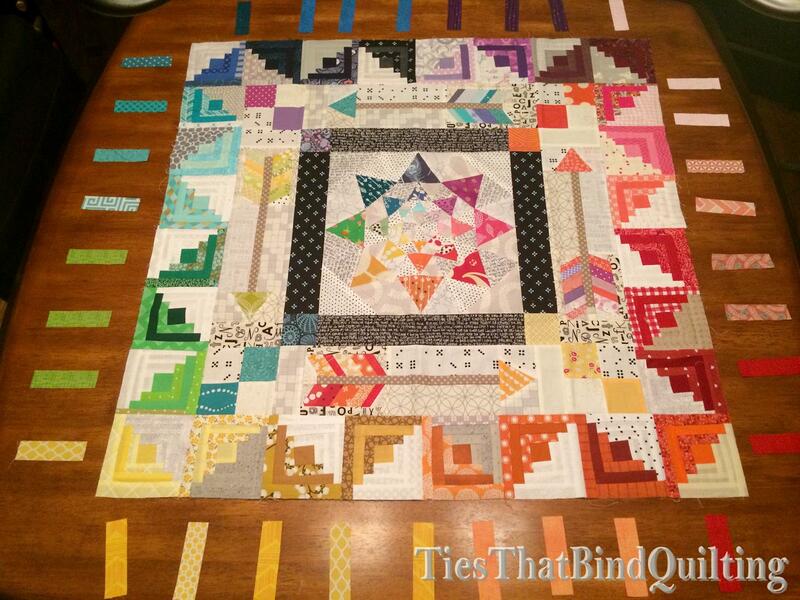 Last time I checked in, I had sewn them all up into a bunch of HST and hourglass blocks. 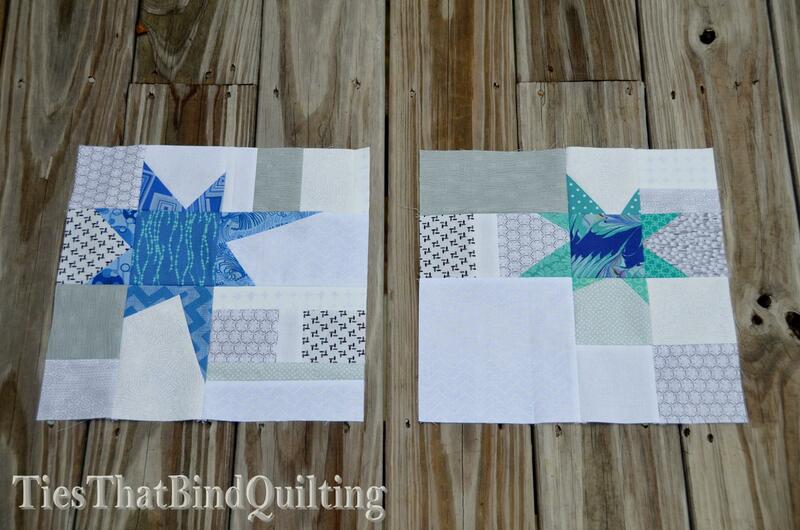 Well, those blocks turned in to not one but two different quilt tops! I had to get them both quilted up and bound really quickly too because they were for something really important. Everything was happening so fast that I wasn’t even able to get photos of one of them outdoors! My kitchen floor around midnight had to do! I really love the look of the black and white striped binding! Now what was the rush you ask? 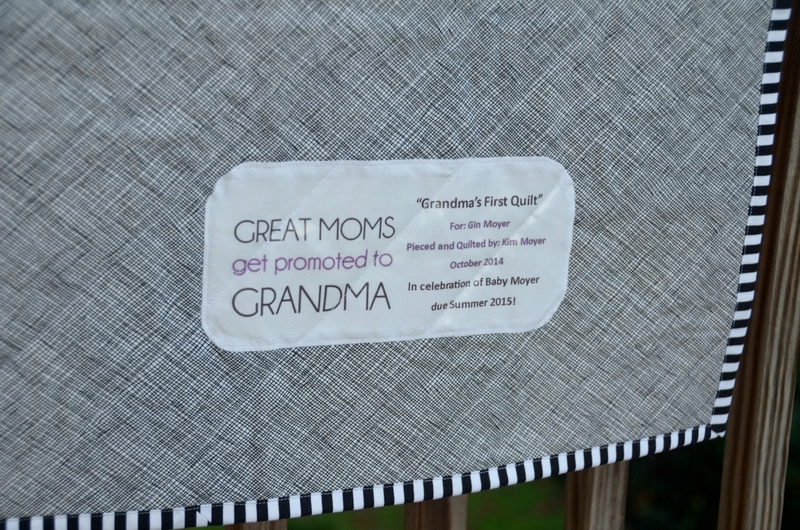 Well – these baby quilts were used to announce to both my mom and my husband’s mom that they are going to be grandmas! 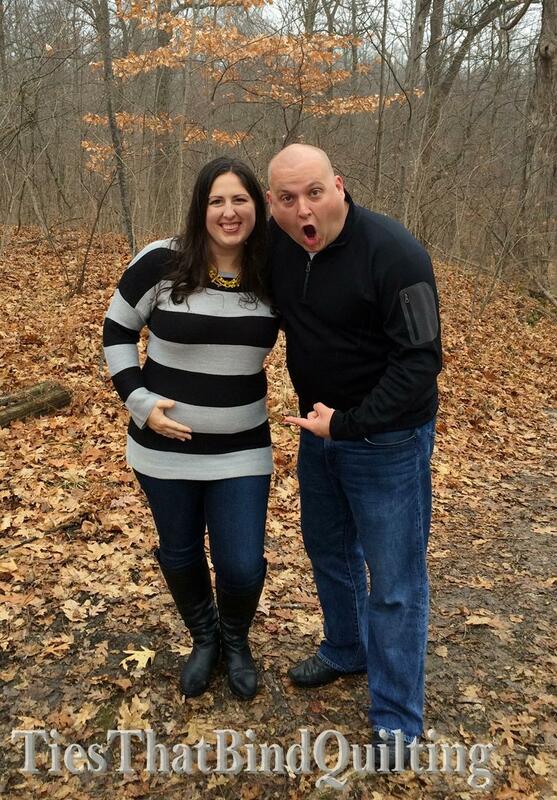 That’s right – I’m pregnant and we’ll be having our first child (a baby girl) in June! I couldn’t wait to tell them so both quilts were finished and gifted within a week of me and my husband learning the news ourselves! 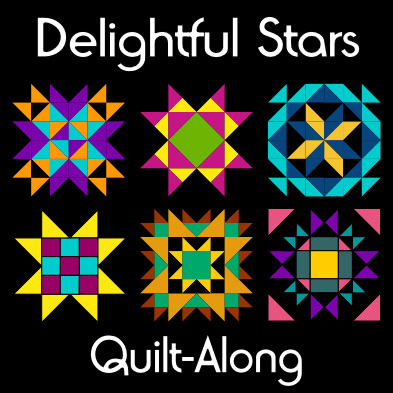 Both of our moms loved their quilts and started crying as they read the label on the back! So that is why I haven’t been posting as much lately. Pregnancy fatigue and getting ready to grow our family has been stealing a lot of my time and, while I’ve still fit some sewing in, I haven’t found time to actually post about. But hopefully I can get back on track here soon! She also sent a cute little fox but I forgot to take a picture of him! My mind immediately went to the beautiful fall colors at Brown County State Park since Christina is from my home state of Indiana where I was born and raised. But then I thought maybe I should look more at fall in my new home state of Georgia. And here in Georgia, we love to go apple picking in the fall. I have always loved apples (they were always a favorite snack as a kid) so I love getting to go up to North Georgia every fall and pick apples. And we’re always eating everything while we pick too! 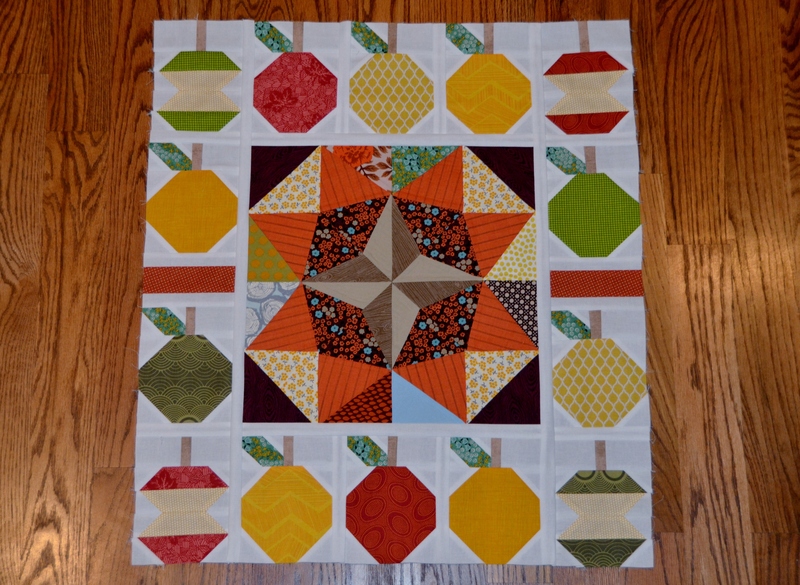 So I decided that Christina’s quilt needed a border of apple blocks! 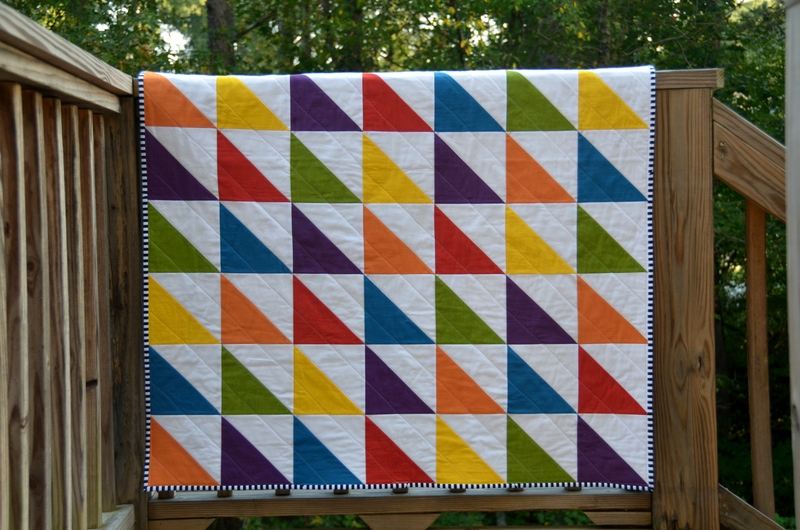 I am in love with how this turned out and it actually makes me want to make a fall themed and colored quilt for myself! 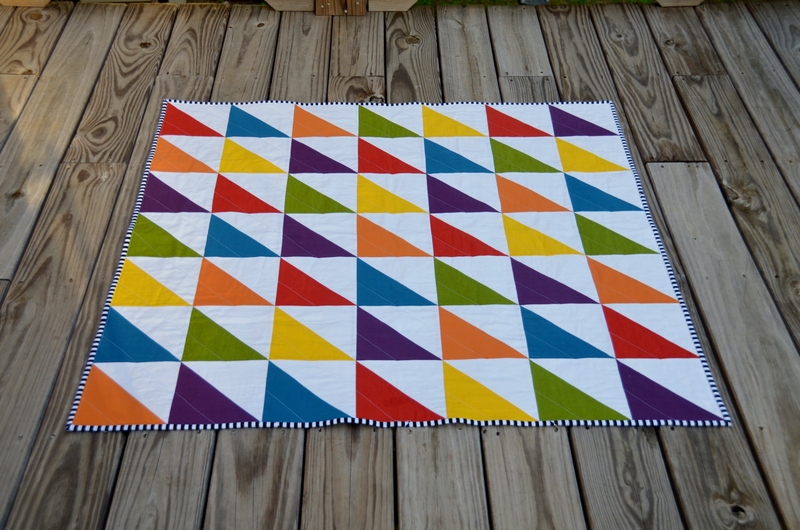 Let’s go ahead and add one more thing to the ever growing list of quilts I want to make! I think the apple cores in the corners are my favorite part. They are my husband’s favorite too! 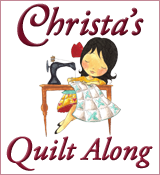 Christina is having each of us make these little signature blocks for her quilt too. Look how tiny it is compared to my rotary cutter! 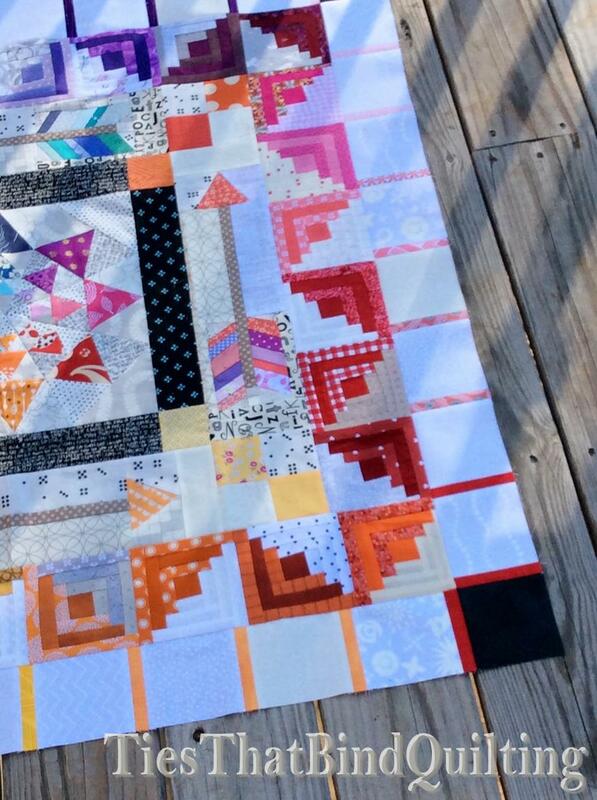 I hope Christina likes how her quilt is taking shape so far and I can’t wait to work on Chelsea’s quilt for round 2!